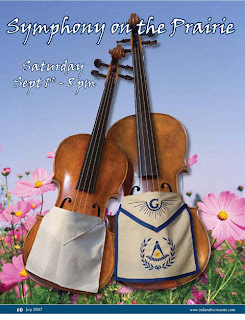 I'll be speaking at my Mother Lodge, Broad Ripple Lodge #643's Education Night, tonight, (Thursday 8/30/07) at 7PM. 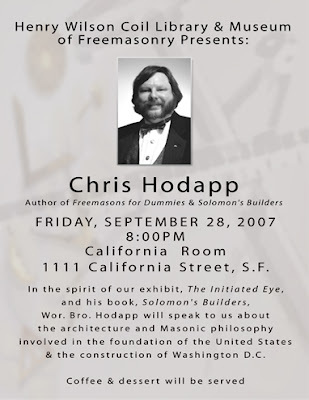 Topic is Masonic influences in the founding of the US and the building of Washington DC - the truth and the fiction, along with a few surprises. Plus Masonic sites in DC, from my book "Solomon's Builders." If you are in the Indianapolis area, hope you can make it. This is not a tuyled meeting so non-Masons, new candidates, EA's, FC's – all are welcome. Dinner won't be served, but we'll be meeting up at at Sahm's Place at 65th and Keystone afterwards - great food, and always great fellowship. An outstanding post from Tuesday by Tom Accuosti – Go Take A Pike – on the subject of Uncle Albert and the misuse of his, and others', writings about Freemasonry as quotable sources by non-Masons. I don't expect for one second that it will get through to the anti-Masonic crowd that uses these quotations like they come from some official Masonic source as Law. But maybe if we repeat it as often as they haul out Taxil hoax misquotes, perhaps the undecided majority will see the anti tactics for the frauds they are. Anyone whose fingers are just itching to smear Freemasons with Pike's musings on symbolism, history, religion and speculation, needs to read Tom's post first. I don't care if they want to argue about it based on true statements or on what are the real words used in Grand Lodge materials or rituals. But to cherry pick tomes like Morals and Dogma for some offending (and often made up!) paragraph, and to hang the fraternity with it is infantile, dishonest and just plain idiotic. 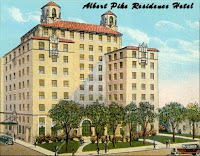 Completely off the track sideline: who knew there is an Albert Pike Residence Hotel in Little Rock? It seems to be a retirement home, but the ballroom looks like a happening place for weddings. But what's curious about its heritage is that, using Pike's name, it was a Baptist Ministry for a while. Which should come as a surprise to some of our less than enthusiastic Baptist critics. Jinkies! Now how did that happen with all that Luciferian stuff going 'round? Saturday, September 1st, 2007, 8PM, FIREWORKS! Saturday Sept 1st is the day we would like as many Masons to attend as possible. Sunday is the rain day, but we have sponsored both days. The River City Brass Band blends brass and percussion in stunning repertoire that includes American favorites, big band swing, jazz, classical and contemporary masterworks. The evening will end with an exciting fireworks presentation. Call Indianapolis Symphony Orchestra Box Office for tickets at 1-800-366-8457 and give the representative discount code found in the Indiana Freemason magazine (or send me an email and I will forward it to you). For those not wishing to sit on the lawn, a limited number of tables are available. Ask the box office. We're typing as fast as we can. 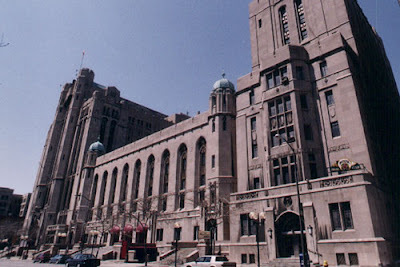 Detroit Masonic Temple Rebirth Coming Soon? The Detroit News reports this morning (a little prematurely, it seems, but a scoop is a scoop), that Little Caesar's Pizza founder Mike Ilitch seems to be moving closer with plans to take over the incredible Detroit Masonic Center. This is a huge development that could be the true savior of the largest Masonic building in the world. "Ilitch Holdings Inc.-- the billion-dollar family empire of sports, entertainment, pizza and real estate in downtown Detroit -- hopes to venture into a long-abandoned stretch of the city: the Cass Corridor. Ilitch's Olympia Entertainment is negotiating to take control of the iconic Masonic Temple, a city landmark mired in so much debt its owners, the Masons, face losing the building. The deal could be announced within a week to 10 days, said Bill Betz, president of the Masonic Temple Association, which would continue to own the 16-story landmark. An Ilitch-run Masonic could be an energizing development for an area trapped in poverty and decay, according to city, business and neighborhood officials. It is the one spot left in the city core that could most benefit from a business titan who revived the Fox Theatre area 20 years ago, they say. A Masonic deal could be transformational, Betz said. "In five years -- the whole neighborhood -- you won't recognize it," he said. Security and money from entrepreneurs willing to back projects near an Ilitch endeavor will likely follow the Little Caesars Pizza owner into "the Corridor," developers and city officials said. Ilitch Holdings spokeswoman Karen Cullen would only say "discussions are continuing." Kudos to the dedicated brethren who have worked tirelessly behind the scenes to save the Masonic, instead of just turning their backs. The Masonic is the center of Detroit's appalling Cass Corridor, a blighted part of the city that was once a thriving center of the community. There are so many incredible architectural gems in the area, but as the Masonic has gone, so has the neighborhood. With this new development, it looks like Detroit's Blue Lodges and York Rite may be at the center of things again. Instead of fleeing, some have come home again. Perfection-Mosaic Lodge No. 530 has recently come back to the Masonic. Be sure to check out the book, Detroit's Masonic Temple by Alex Lundberg and Greg Kowalski. 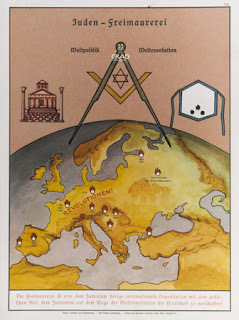 Well, it seems that us terrible Freemasons are out to force an anti-Christian Union on Europe, the poor old thing. News that the European Union could soon open an investigation into tax breaks that the Italian Church enjoys in the property market sparked a fierce political debate in Italy Tuesday. "It's good news that the European Commission is gathering information on competition violations," Green party senator Natale Ripamonti told ANSA agency. "Hopefully our pro-European country will dispense with these privileges," he added. The Green party forms part of the radical wing of the current ruling coalition. But the Christian Democrat UDC party dismissed the Brussels initiative, suggesting it was the product of "radical Freemason" circles. There's nothing like a panicked politician when cornered. But he had to reach awfully deep to find a Masonic bogeyman. And here I thought our numbers were shrinking and that Freemasonry wasn't relevant to anybody anymore. Yet here we are snatching the Vatican's tax free status from them? Incredible! Find out why you don't need to roll up your trouser legs to get into Norwich's Masonic Hall on St Giles Street. Free tours of the intriguing 17th century hall run all day on Saturday and Sunday. They just can't stop themselves from that hilarious "rolled up trouser leg" gag. "After hearing about how some lodges are "lily-white," and that some areas in the U.S. make it uncomfortable for people of color to become Masons, I find it completely heartwarming that my lodge is so multi-cultured. Almost every minority is represented, and with each of my grandparents from a different country: (American Indian, Mexican, Australian, & Italian), this place just feels good." It's been a bad week around Hodapphaüs. There was a fire at the apartment complex we own last Wednesday, and one of our residents perished in the flames. He had put something on the stove, and then fallen asleep. Firefighters concluded that the smoke detector woke him up, and that he tried to put it out, but was quickly overcome by the heat and smoke. Most tragic of all, he tried to crawl out and got into a closet by mistake. My biggest fear was that his wife and two small children were in the apartment, too, but thankfully they were not. When we bought the complex more than five years ago, things like the death of residents never entered our mind. Two years ago, one of our seniors was diagnosed with cancer. He came home, arranged his personal papers, climbed in bed and shot himself in the head. And now this fire is our second death. My deepest thanks go to the Firemen of Engine 8 and Medic 2 for their skill and bravery on what was literally the hottest day of an already scorching summer. And our deepest condolences, thoughts and prayers go to the family of Keith Richardson, especially his wife Oreather, one of the sweetest, kindest ladies I have ever met. Many thanks to Brother Stan May for his work in setting up the "Keith E. Richardson Jr. Children Fund" at First Merchants Bank. Freemasons and friends in and around central Indiana next weekend - stop in and enjoy the day at the Indiana Masonic Home Festival in Franklin next Sunday, August 19th. Gates open at 11:00 AM. There will be music, food, games, plus Civil War and World War II reenactors. Stop in at the vendor's tent. I'll be there with books. Or bring your copy from home - I'll be happy to sign it. The second trailer for National Treasure: Book Of Secrets was released over the weekend, telling some major plot points. They are still filming this week in London. See it on the Apple website - it seems to play smoother. 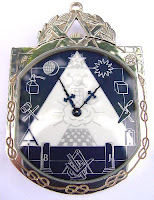 Brother Kurt Kurosawa posted an interesting idea on the Masonic Light Forum today. He visited a lodge in the Philippines that, at its stated meetings they have a 40% attendance rate - about 20 attendees out of a total of 50 members. "teaches us that all men are gifted with the same good measure of time each day to discharge all their duties in life, as well as for work, refreshment and rest, but they remind each other that a 30-day month contains 720 hours, so that the bare minimum involvement of attending a stated communication, if it consumes 4 hours, would demand of them only half of one percent of their time." Isn't your lodge worth one half of one percent of your time? Is your lodge worth one half of one percent of your members' time? Well, it wouldn't be a proper Monday morning without one of these coming across the wires. One of Italy's best-known priests has apologised for accusing a liberal Jewish lobby of trying to weaken the Roman Catholic Church, saying he meant to refer to a a Masonic lobby instead. The gaffe is the latest from 82-year-old Pietro Gelmini, a priest known for his drug rehabilitation centres and powerful political allies in Rome, after he confirmed last week that he was being investigated for sexually abusing young men. Thanks so much, Father. I guess that's the new strategy when you're accused of sexually abusing young boys - deflect by quoting from the Eichmann playbook: "All Jews Masons, All Masons Jews." As a Catholic and a Mason, I don't know which part of your behavior to be disgusted with first. The Indianapolis paper has its own weekly giveaway called Intake, billed as being "written by Gen-X-ers, for Gen-X-ers." A decidedly dubious recommendation, to be sure. 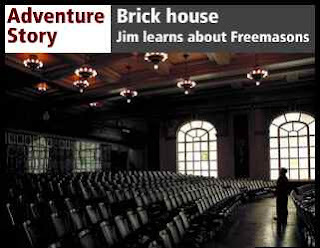 Anyway, I led reporter Jim Walker and his friend on a tour around Indiana Freemasons' Hall for three hours about a week ago, and here is the result. Strange. He didn't seem creeped out at the time. Golly. That was a close one. Apparently Christianity Today, a "magazine of evangelical conviction," has decided that Freemasonry is "nearly forgotten." It has looked at our membership figures and decided that 1.8 million U.S. Freemasons are such a small enough number as to now render us flaccid, or at least impotent. "(Masonic m)embership is half what it was 50 years ago. It's hard to believe that Freemasons and similar secret societies were one of the top three social ills targeted by evangelicals of the mid-1800s, along with slavery and alcohol. A slightly refreshing point of view is that the author, Ted Olsen, seems to be asking what was all the hubub, Bub. 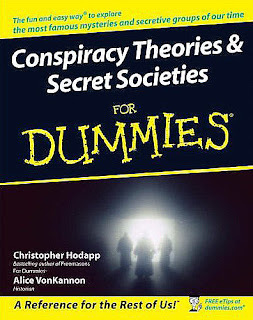 "Now Freemasonry is nearly forgotten, and the Christian campaign against "secretism" had little to do with the decline. That makes me wonder how much our social-reform campaigns of the early 21st century resemble those of the mid-18th." Of course, on the other hand, one of the hotlinks in the article is from the appalling, abysmal, anonymous and hysterical Canadian website, Freemasonry Watch (to which I'll forego a link, just because, you know, no sense in feeding the animals). Not exactly the sort of reference I would use if trying to bolster my position as a credible commentator on any subject. Not to be a provocative churl, but if we're comparing numbers, I wonder what the circulation is of this magazine of evangelical conviction. I'll take a stab and guess it's something on the order of less than 1.8 million.